A part of the consultancy I that do with organisations, I run specialised workshops on different areas of Moodle. Today I will be running a workshop on Moodle file management, so I went through the process of setting up Dropbox as an example repository for external file storage. Dropbox and Moodle Workshop Demo. The student account is for adding his own files into Dropbox. You cannot apply for production status without having users linked successfully to the Dropbox account. So with the Dropbox accounts created and working, on with the show.. Within Moodle I first enabled the Dropbox repository. I then configured the Dropbox API setup in the repositories plugin area using the API key and Dropbox secret that I had created earlier. I also set the cache size to 0 – (zero) so all files would be cached regardless of size. Files are only temporarily cached on Moodle. And lastly, I created the course and added James as teacher and Paul as a student. So that was the basic preparation out of the way. So for the demo itself, I then logged out of everything, dropbox, Moodle etc to clear the cache and have no active logins on any site. For the purpose of the demo I used Google Chrome as the student and Firefox (my preference) as the teacher. I find this is always a good approach when doing testing of courses using one browser for each role. So I logged in as the teacher on Firefox and accessed the course. 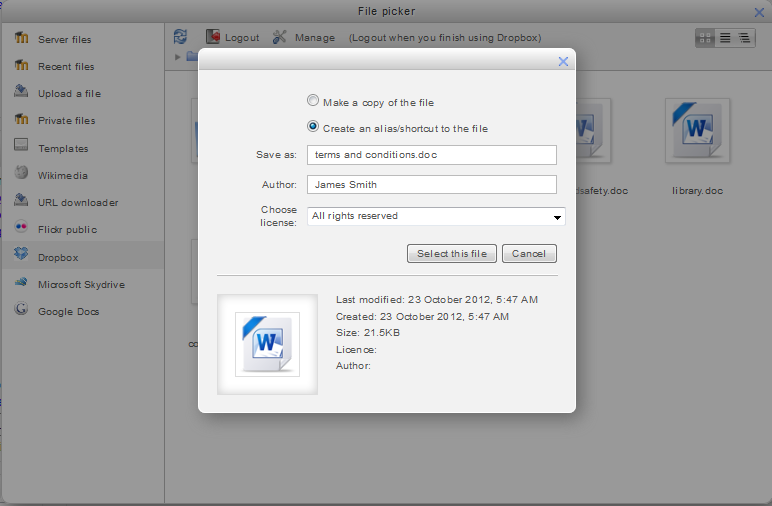 I had two tasks to do, firstly to create an assignment and then to add a file from Dropbox. So I enabled editing and created an assignment for the user to upload a file. I then wanted to add in the Terms and Conditions file that I had in the Dropbox of James. 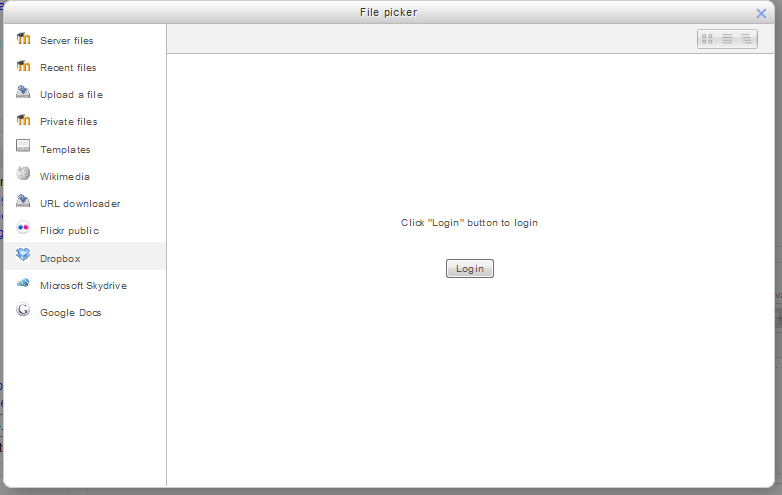 Then under the Content area I clicked on the Add button to launch the file picker. 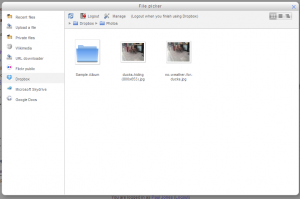 The file picker allows you to choose files from whichever sources are enabled including in this case Dropbox. I clicked on login and it brought up a window for me to log in, so I logged in with the James Account. So to proceed I clicked Allow. Moments later I could see my Dropbox in the File Picker, and the four files I had uploaded earlier including my terms and conditions file. or just to create an alias/shortcut to the file which would leave the original in Dropbox and just link to it so that when people accessed it, it would take the Dropbox file. 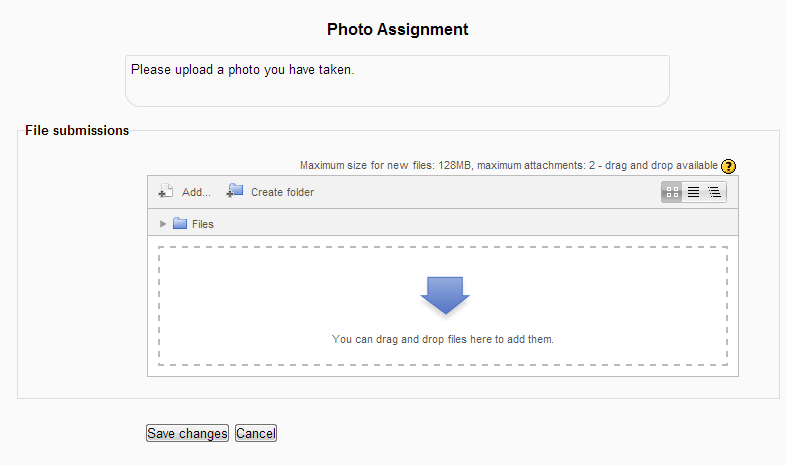 This means that the Dropbox based file can be updated and the link in Moodle will update itself once the cache expired. 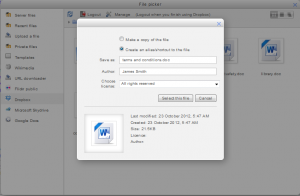 I selected Create an Alias and clicked on Select this file. Back in the Add file page, I selected Force Download as the Display option and saved and returned to course. I always recommend the force download option for files so the user will not have the experience of the browser embedding which can sometimes be off-putting. So that was that with the teacher account, assignment created and a file linked from Dropbox. I logged in as the student on Google Chrome and accessed the course. First thing I did was click on the Terms and Conditions file. It immediately downloaded the file for me, without prompting as Chrome does. I opened it and it was fine. So although the file was stored in the teachers Dropbox and linked into Moodle, the student did not require a Dropbox login to view the file. Then I went on to the assignment. It was a photo assignment and asked for the student to upload a file. 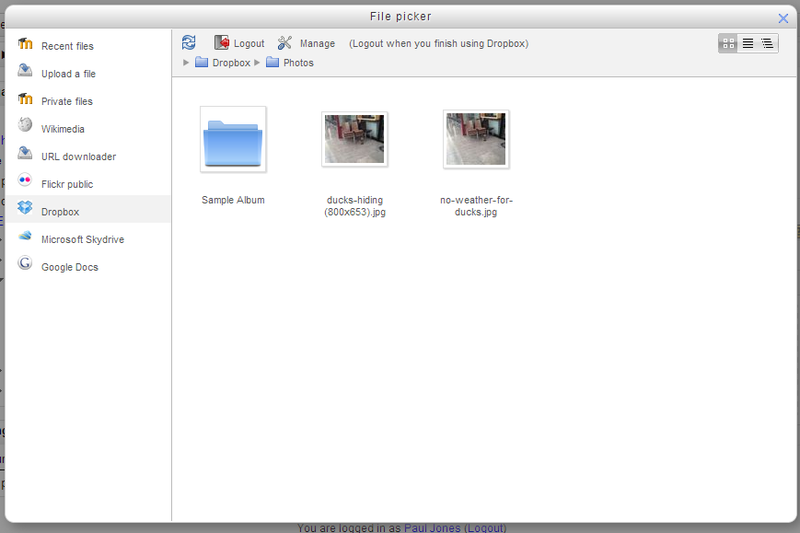 I knew that I had a photo in the student Dropbox account, so I clicked on Add to launch the file picker. 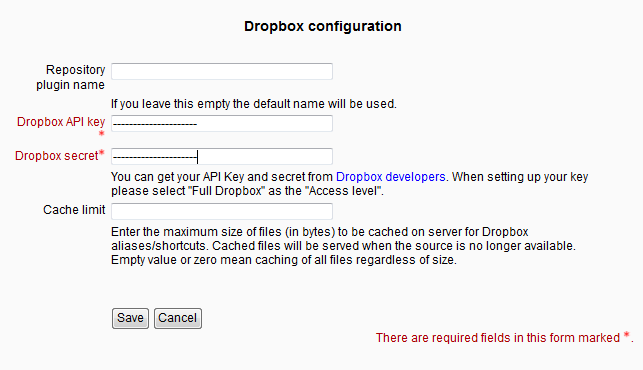 I then selected Dropbox as a source for the file and it prompted me to log in. I logged in as the student account I had created earlier. It then prompted me to confirm I wanted to link the Moodle site to the account. So I clicked Allow. I saw my two pickers so I selected the smaller one and it prompted me to confirm. I clicked on Select this file, and it added the file into my Moodle assignment for me. I clicked on Save changes, and that was it done. So what can you take from this walk-through? Finally apply for production status. 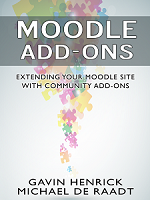 They key aspect is here that Moodle when installed on your website is Your Application, so you need to go through the process. This is required whatever the application is. It is not difficult and not even very time-consuming for the testing phase. The whole test above took less than twenty minutes although I do not know how long it takes for production approval. Teachers can use Dropbox as a source for their files, and either link to them so that the can just update the file in Dropbox but others can access without even knowing it is in Dropbox, or take a copy of the file into Moodle. Students can use Dropbox to store their files until they need to add into Moodle for their work. So all in all it is pretty straight forward and simple enough to use. If you have any questions on this, feel free to add a comment below! One question that popped up and sorry for my naivety (only in testing stage of dropbox myself). You say Students can access the drop box? do they get to see every file in the drop box? or get allocated just one folder to upload their work too? I have a large site and don’t want 20,000+ students seeing other learners work (plagiarism crossing my mind). They access their own dropbox using their own account. They do not access a shared one. 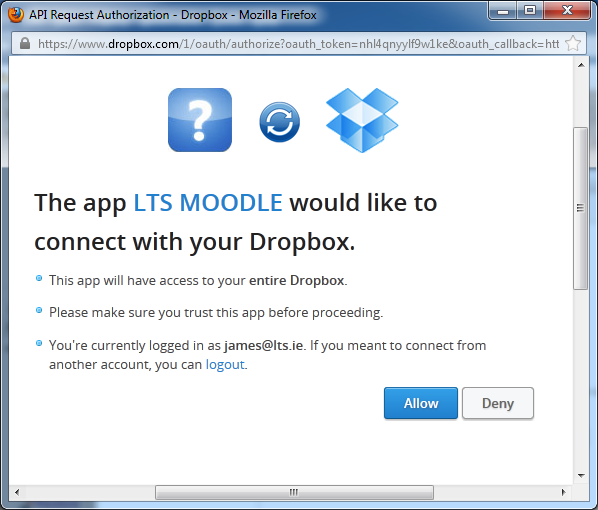 So, if they access their own dropbox, would I then as admin have to set up every students drop box in Moodle? No you won’t have to do that. 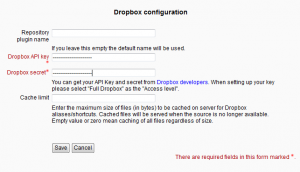 Once the repository API is configured in moodle for the institution account, then any user who can access the File Picker can “login” to their own dropbox. Right, I did think that was the path you were leading me down. Excellent one HAPPY Moodler Admin. The app for 5 users, Gavin. Does that mean I am limited to 5 Moodle students? Sorry if this is a dumb question – I’m not yet a Dropbox user. That is just for testing, you need to apply for production status after that. Do I need to be concerned with the amount of storage available for the institutional dropbox? Or, are the physical files stored within the teachers’ accounts and then just shared with the institutional account? Quick Update, the approval for production status took less than 1 day – impressive. Gavin, I really appreciate this article. It is very important to “Selected Full Dropbox” when creating your app, as it will not work otherwise, and you can’t change your app – have to delete and restart process. Thanks so much, more helpful than the documentation on Moodle. A tip of the hat! thanks! 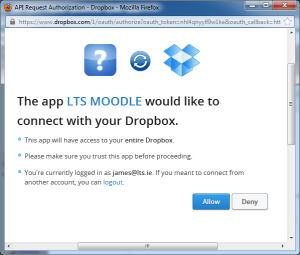 followed your guide – the only problem was that neither the student or the teacher got prompted from dropbox if it was ok to connect to moodle. the dropbox files opened directly in a seperate pop-up. The only one who got the message (and got the dropbox file in the file picker was the admin person).. Were you sure to be using different browsers for each role? Otherwise you need to be clearing cache/sessions etc on main one to be sure ot be logged out of everything. You have to click the blue button that says up to 5 users can test before the other people will see the Dropbox link button. We hit the same issue, then after I clicked that link on the drop box page, to start the testing, it worked. It now lists the other teacher who linked their account. that blue button did the job – everything works fine! Please forgive my ignorance but I cannot see the blue button. Where is it please? First of all, thanks for this post, it is going to save me a lot of time. Second, I am having some trouble with seeing the updates I make in Dropbox on the Moodle site. When you see the cache needs to clear what do you mean? I had a teacher link (create an alias) to a file on her Moodle page. Then we went and updated the word document and click on the link in Moodle and the change wasn’t reflected. We then cleared her browser cache and tried again and no change. I then walked over to my laptop and clicked on the same link and it was till the original file? Is there just a time lag? 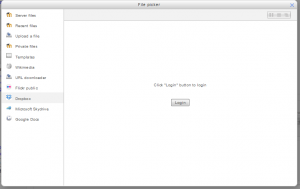 I have no problem with that – did you reload the window with filepicker? I am having a problem using drag and drop to move files from Dropbox to Moodle. Editing is turned on, but when I drag the file into Moodle and release the mouse, the file opens instead of being put into Moodle. 1.BMSS Knowledge Repository would like limited access to save information in your Dropbox. 2.Remote repository returned error: App is not allowed to access this API. What do I do if I want students to work in groups and see a file they are each uploading how do I set group access to separate shared drop-box folders for 5 people? 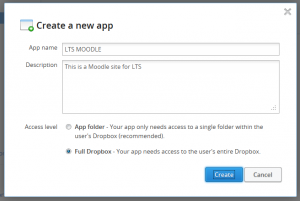 Im trying to add dropbox in our moodle site for student group work is this possible? Also I’ve gone through the process but am unable to link to 5 users to test as that option is not available to me. Where should it be please. Hi, I was wondering if it would be possible to configure the Dropbox API for all users to have access to the institutional dropbox account, but only to specific folders that are given permission to, without them having to create or login with their own dropbox accounts. Would that be possible to manage, somehow? There’s a WordPress plugin that says that can manage just that (http://codecanyon.net/item/outofthebox-dropbox-plugin-for-wordpress-/5529125) so I was wondering if it would be possible to do the same in Moodle (if that is what that plugin actually does, of course…). Thanks a lot, great post!